Week 5: Half-marathon update | Fit Girl. Happy Girl. 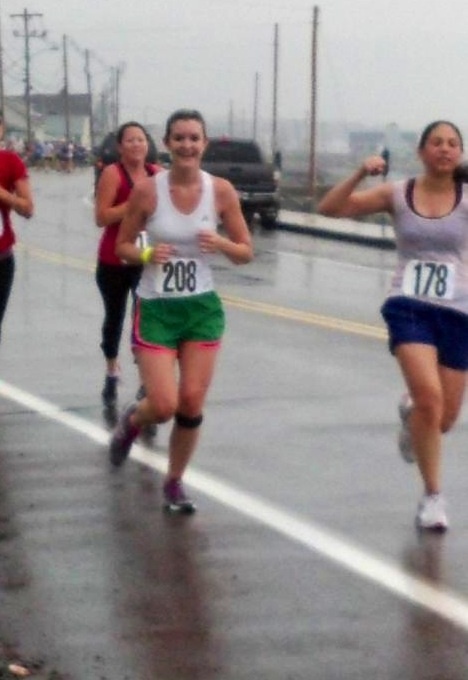 A very rain-soaked road race on the 4th of July! This week was yet again another amazing week of training. I ran my first official road race and my longest run yet! I logged just about 19 miles this week- same total as last week, different way of adding it up. Monday night I did a tempo run at the local track. 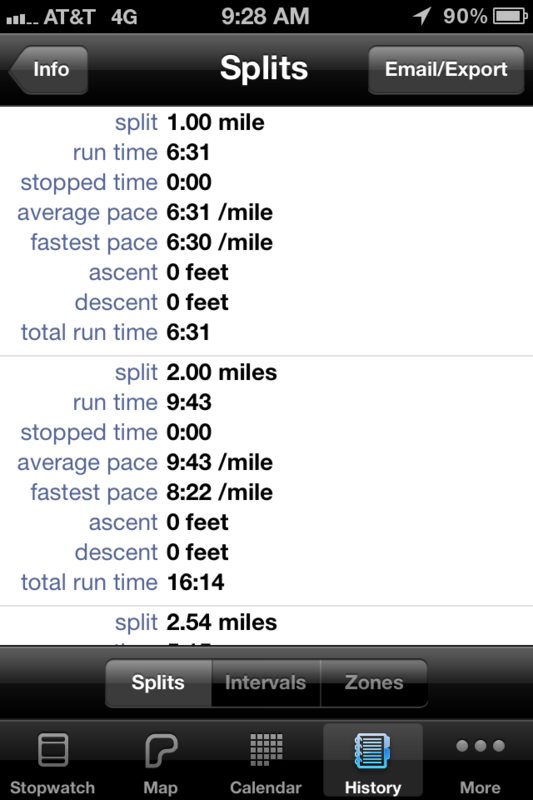 Instead of doing my normal tempo run, I used “run interval” mode on the Run Keeper app on my iPhone. It had me run a total of 2 miles with 400-meter sprints mixed with slow running. It went really well and I ran my fastest pace at 7:32/mile. I rested on Tuesday and did some yoga in the morning to stretch. On Wednesday, I ran my very first road race. I know this is kind of weird because I’ve been blogging about running since March but this was my very first race. It was so great (besides the fact that it was pouring)! I finished the 4-miler in 37:16 with an average pace of 9:20 which I was pretty pleased with, given the conditions. I gave myself a total rest day on Thursday and then ran an early morning run on Friday. I wanted to test my speed especially after the race so I decided to do a 2.5-mile run around my neighborhood. I was SO excited when I came back and checked Run Keeper to see that I ran my first mile in 6:30. That was the fastest mile I have EVER run! I was so excited to see how much my work has really paid off! The one criticism I have of this run is I wish I could have done a negative split, that is running faster in the last half of the run than the first. I’m going to try to work on that in the next few weeks. Saturday was my long run day, a full 10 miles. This is the longest I have ever ran and I have to say it was my most fulfilling run yet! 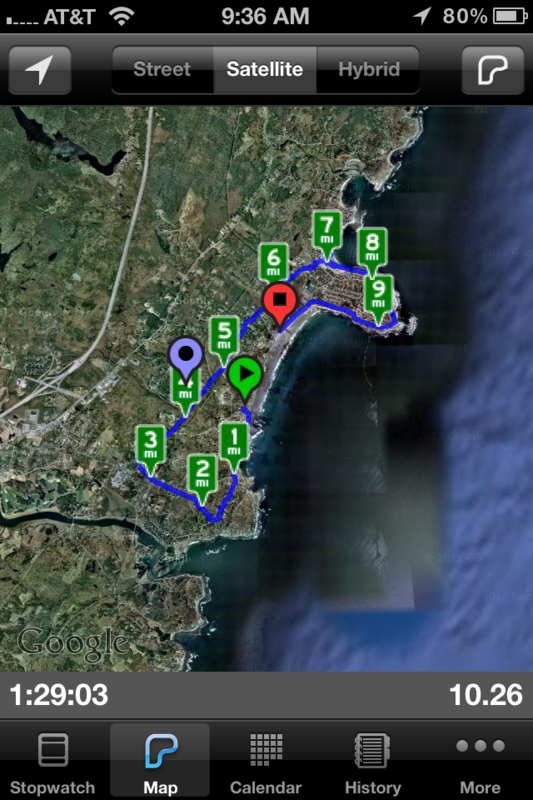 I ran a total of 10.26 miles in York, Maine with my cousin Paige who is also training for the half-marathon with me. Our route was pretty hilly but we were unafraid, I was even really, really excited! Map of the 10.26 mile route. The run was fantastic! We decided to go at an easy, what I like to call “conversational” pace. This means while running, you’re able to hold a conversation with someone without getting winded. We thought we were going pretty slow but turns out our average pace was 8:41/mile, a faster average pace than I had ever done. We finished the run in 1 hour, 29 minutes and 3 seconds. The craziest part was our fastest pace was 4:51/mile! What!?!? When I looked at the breakdown, mile by mile of our run, I couldn’t believe how well we did. We peaked at mile 8, when we ran it in 6:36 and ran our fastest pace of 4:51. In total, almost all of our miles were sub-9:00 besides the 6th mile where we had our steepest incline. 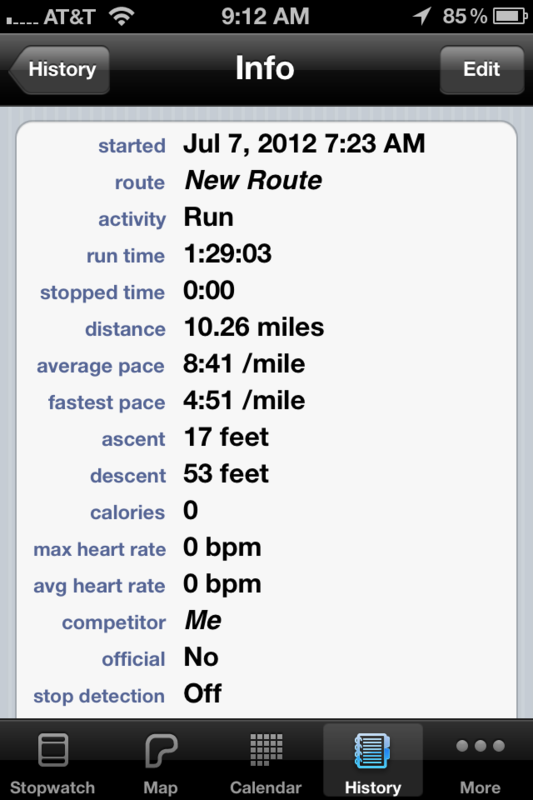 10.26 mile run: average pace- 8:41, fastest pace- 4:51. After this week’s training I am a full believer in the biggest you can dream, you can make it happen. Four months ago I could barely run a mile without feeling like I was going to fall over and die. Now, I feel like I can go forever and I’m just getting faster. More than anything, it makes me so happy. I hope everyone else had a good week of training. Happy running!